Future Retro's Revolution Synthesizer R2 looks amazing; we completely have no use for a synthesizer, but we totally want one. With a complete aluminum construction, perfectly contrasting gun gray and white colors, as well as a smattering of blue LEDs all over, this synthesizer makes us moist in the most clichéd way possible. 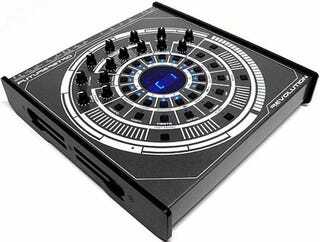 If that was not enough to get you interested, perhaps the circular sequencer interface, which allows single handed control; the ability to play patterns forwards, backwards, upside down and sideways, as well as remote pattern selection using MIDI program change messages will have you reaching for your anorexic wallet?